Boys summer camp located in Waterford. Take a camp tour and find information about the camp dates and the camp history. A traditional boys residential camp on Echo Lake. Features camp description, 360 degree camp views, newsletter, alumni, campers and counselor information. Childrens residential summer camp in Readfield. Features camp experiences, staff experiences, a message board, and a camp video. Traditional boys camp located on Bear Lake in Waterford. Offers land and water activities, fine arts, fencing, and a climbing wall. Take a camp tour, find lyrics for camp songs, and get registration and program information. Offers modules that plug directly into any existing camp Web site: Email Manager, Photo Manager, Camp News, Camp Talk, and Camp Store. Product overview, links to sites using the service, and contact information. Offers several programs at Drake University in Des Moines, Iowa: day camp for K-12, individual camp for grades 5-12, junior high camp, and senior high camp. Includes prices, dates, schedules, features, and registration. Designed to honor and bring back memories of the camp operated from 1946-1962 in New Yorks Allegany State Park. Includes history of the camp, photos and videos showing it today, camp memories, and email from campers and staff. A nostalgic rant through the 1970s summer camp experience at Camp Zoe, Round Spring, Missouri. Advice, resources, and gear for parents, kids, camp staff, and camp directors. A residential instructional camp for boys. Information about the camp, its history, activities, facilities, and staff. Summer camp for ages 6 thru 15. Includes information on camp history, facilities and activities. A summer residential camp for girls. Description of camp, programs and alumni message board featured. Boys residential summer camp. Provides details on camp activities, and staff. Fill out an application online. Their interactive camp search assists in locating a summer camp based upon the specific criteria desired. A new co-ed Jewish summer camp. Provides history of camp, photographs of buildings, activities, schedule, and contact information. Summer day camp in Lake Forest. Description of camp programs and philosophy. Camper and staff applications. A residential camp for boys and girls ages 7 - 15 in Haliburton, Ontario. At Northland you will find all waterfront activities and landsports, arts and crafts and Judaic program. Camp programs are designed to emphasise responsibility for self and building leadership skills. The camp kitchen is Kosher (COR). A book for prospective overnight campers. Choose and prepare for camp, discover what camp is all about. A new co-ed Jewish summer camp in Bridgton. Provides history of camp, photographs of buildings, activities, schedule, and contact information. Summer camp for children age 8-14. Features archive of camp from past years, photographs, guestbook, and registration. Co-ed residential summer camp in Grand Rapids, Minnesota. Staff, camper, and camp information provided online. A riding camp in Canada with over 12 other camp activities. Provides photographs and information. Located on a private lake, near Toronto, Ontario. Related girls camp and boys camp. Features camp philosophy, staff, and activities plus applications. Camp for teams and individual players. Directors, dates, camp features, curriculum and application. Related girls camp and boys camp in Brevard. Features camp philosophy, staff, and activities plus applications. United Church camp on Last Mountain Lake near Regina. Runs a day camp and weekly resident camps for ages 6-16. If the business hours of Camp Ramaquois in may vary on holidays like Valentine’s Day, Washington’s Birthday, St. Patrick’s Day, Easter, Easter eve and Mother’s day. We display standard opening hours and price ranges in our profile site. We recommend to check out ramaquois.com/ for further information. 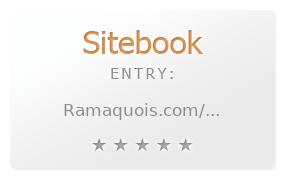 You can also search for Alternatives for ramaquois.com/ on our Review Site Sitebook.org All trademarks are the property of their respective owners. If we should delete this entry, please send us a short E-Mail.